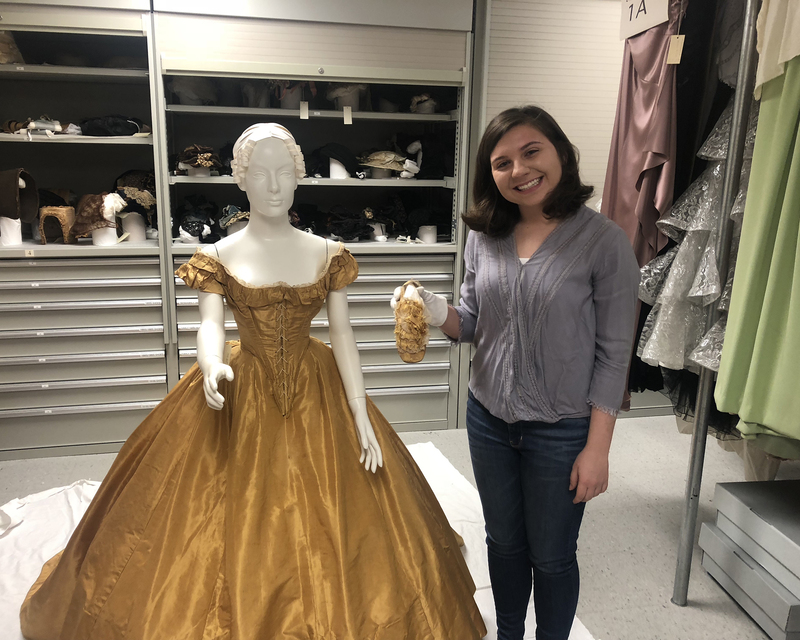 WOSU Public Media intern Sarah Charlton stands next to a mannequin dressed in a Civil War-era evening gown from Lancaster, Ohio. The gown is part of Ohio State’s Historic Costume & Textiles Collection. Hello, everyone! My name is Sarah Charlton, and I’m a research intern for WOSU Public Media. Since early January, I’ve been helping the Columbus Neighborhoods team with historical research for their upcoming episode on Lancaster, Ohio’s involvement in the Civil War. To see some of this research come to life, be sure to watch the show at 8:30pm Thursday, April 12 on WOSU TV. I’m studying history at The Ohio State University, specifically focusing on early American history. Though I can’t pinpoint when my passion for history first developed, I think it most likely began during my childhood. I grew up in the village of Granville, Ohio, just 40 minutes east of Columbus. From Alligator Effigy Mound built by the Fort Ancient Native Americans, to the homes of multiple conductors on the Underground Railroad, my small hometown is a historical gold mine. I continued to develop this passion through high school, and upon arriving at Ohio State, I declared a history major early on. My passion for history is even evident in the names I chose for the two kittens my family rescued a few years ago: Thomas (Tom) Jefferson, and Benjamin (Ben) Franklin. Our family dog, Winnie, was named for Winston Churchill. My parents have been instrumental in helping shape my love for studying history. We took family vacations to places like Jamestown, Virginia, and Philadelphia, Pennsylvania, encouraging me and my three siblings to develop an appreciation for the past. This passion has only deepened since helping the Columbus Neighborhoods team. With their guidance, I’ve gathered historical materials relating to Lancaster, created an interactive timeline that follows Sherman’s March to the Sea, and interviewed a local historian for a Facebook live video about women and what they wore during the Civil War era. Each of these experiences has not only been fun, but has also allowed me to grow as a student of history. I was most fascinated to learn that during the Civil War, Lancaster was so divided politically over abolition that two different newspaper staffs with opposing views on the issue fought in the streets of Lancaster. The newspaper friction turned even more violent when one staff ransacked the office of the other. It’s pieces of history like this that keep me captivated by the past. All in all, I’m thankful to have had this opportunity to work with WOSU over the last few months. I’ve learned more than I could ever have anticipated. Tune in to WOSU TV at 8:30 pm Thursday, April 12 to learn more about the history of Lancaster! This entry was posted	on Monday, April 9th, 2018 at 3:19 pm	and is filed under Blog, Story. You can follow any responses to this entry through the RSS 2.0 feed. Both comments and pings are currently closed.